A triple suicide bombing at Istanbul’s international airport Tuesday night bears all of the hallmarks of an ISIS attack. But it’s unlikely that the militant group will claim responsibility for the ambush, which left at least 41 people dead. A senior Turkish official said Tuesday night that initial indications suggest the Islamic State, also known as ISIS or ISIL, was behind the attack. Turkish Prime Minister Binali Yildirim said later that it appeared ISIS was behind the “heinous” attack. And a senior US counterterrorism official told NBC that “it is very likely” the attack was the work of 35 ISIS fighters sent to Turkey ahead of Ramadan. The Ataturk attack, moreover, “fits the ISIS profile, not PKK,” a counterterrorism official told CNN. The official noted that the Kurdistan Workers’ Party (PKK) — which is currently waging an insurgency against the Turkish government — doesn’t usually go after international targets, instead focusing its attacks on security personnel in the country’s southeast. “If the Islamic State is indeed the culprit, it would mirror the Brussels’ airport attack of March 2016; this recent attack comes on the two-year anniversary of the group’s caliphate declaration,” The Soufan Group, a strategic security intelligence firm, wrote in its daily briefing. 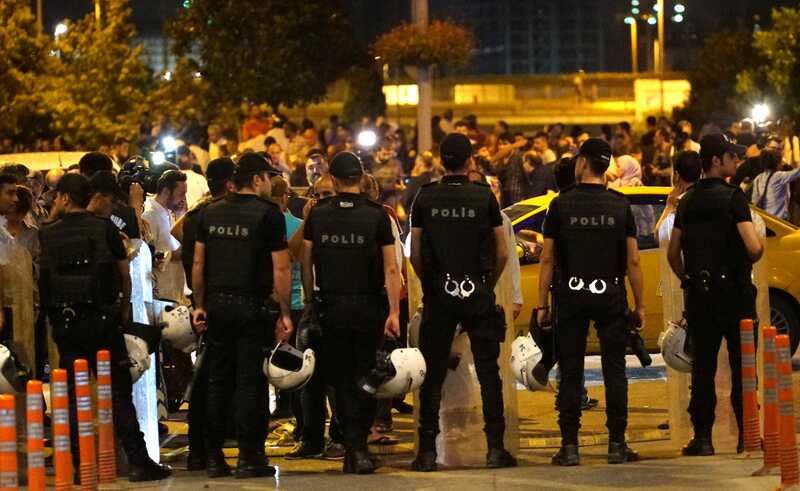 Multiple attacks in Turkey over the past year — in Ankara, Istanbul, and the southeastern border town of Suruc — have been linked to the jihadist group. But the group has never formally claimed responsibility for a major terror attack on Turkish soil, analysts point out. Mehmet Ali Poyraz/Getty Images)Turkish police blocks the road as relatives of the passengers wait outside the Turkey’s largest airport, Istanbul Ataturk, after the suicide bomb attack on June 28, 2016 in Istanbul, Turkey. Humeyra Pamuk, a Reuters reporter covering Iraq and Syria, agreed with those sentiments. “ISIS has never formally claimed responsibility for any of their attacks in Turkey, apart from those in which it targeted Syrian activists,” Pamuk said. Stopping short of formally claiming responsibility for terror attacks on Turkish soil, however, makes sense in light of ISIS’ desire to avoid the wrath of the Turkish government. ISIS has traditionally been able to transport fighters, weapons, and funds across the Turkish border and into its de-facto capital of Raqqa in Syria with relative ease, given the Turkish government’s preoccupation with the renewed Kurdish insurgency in the country’s southeast and the notoriously relaxed border policies Turkey adopted between 2011 and 2014. Turkey officially ended its open-border policy in 2014, but not before its southern frontier became a transit point for cheap oil, weapons, foreign fighters, and pillaged antiquities. Smuggling networks all along the nation’s 565-mile border with Syria managed to emerge and flourish while the policy was in place. Turkey tightened a stretch of its border with ISIS-held territory in Syria in February, increasing military patrols and building more walls. But Ankara has yet to adopt a comprehensive legal framework for how to deal with the militants who come back to Turkey after fighting with ISIS and becoming radicalized in Syria. Even if the militants are caught by Turkish authorities crossing the border, then, prosecutors generally can’t keep them detained for long due to the still-unclear legal definition of ISIS in Turkey. The Islamic State has consequently been able to establish deep networks in Turkey, particularly in Istanbul, Ankara, Konya, Adana, Izmir, ŞanlıUrfa, and Gaziantep, according to the Atlantic Council’s Aaron Stein. Since January 2015, seven attacks on Turkish soil — including October’s suicide-bomb attack at a crowded rally in Ankara that killed more than 100 people — have been linked back to ISIS. “The perpetrators of five of these attacks are all linked to one, active Turkish Islamic State cell, previously based in the southeastern town of Adıyaman,” Stein, an expert on Turkey, wrote in War On The Rocks in March. “This cell operated for close to a year in the city with little interference from the Turkish authorities, despite local residents complaining to police forces that the house was doubling as an ISIL recruitment center,” he added. There have been a number of successful anti-ISIS raids in Turkey over the past six months, Stein noted Tuesday. But were the group to begin formally claiming responsibility for its attacks on Turkish soil, Ankara would likely be under intense pressure to significantly ramp up its anti-ISIS operations across the country. That could spread its resources thin and spark more blowback from the militant group inside the country. “ISIS has selected Kurdish/PKK-aligned targets knowing Kurds would blame Ankara, PKK would ramp up attacks, and Erdogan would de-prioritise ISIS,” Weiss said on Twitter. Even if ISIS has not claimed responsibility for the attacks, however, the group’s rhetoric about targeting Turkey has been heating up since mid-2015. That is when Turkish President Recep Tayyip Erdogan announced his intention to join the US-led anti-ISIS coalition, and gave the US permission to use Turkey’s Incirlik airbase to launch airstrikes against the jihadists in Syria. “IS has built anticipation it will wage jihad in Turkey via increased focus on Erdogan in propaganda,” terrorism analyst Michael S. Smith wrote on Twitter, pointing to an uptick of mentions of Erdogan and Turkey in ISIS’ propaganda channels on Telegram and in its magazine, Dabiq.